For the quiet aspect of the generator, you’ll want to make sure that it isn’t too loud – especially if you’re in a campsite. Generators that are too loud and fuel your inability to disconnect with everything in nature will ultimately ruin the experience for nearby campers. Typically, smaller portable generators are also quieter, as they don’t have the capacity to be as loud as larger ones. There are quite a few brands that are designed with the selling point of being compact game changers, with the feature of being a compact inverter. Lastly, the run time of the generator is pivotal in the usage. You should never drop money on one that cannot withstand usage for less than 8 hours. While 8 hours is a BARE minimum, your generator should run for at least this much time. Those who have extra fuel ready can easily rely on a campsite generator with no problem. The end goal is to make it through a night’s sleep without having to go somewhere for gas so you can run your generator. While the aforementioned factors play a huge role in what you buy, they serve as a blanket of security for what to look for. There are other things that need to be considered when you purchase the best portable generators for camping, and an article as such is something I wish I had when I tried buying my first one. Let’s just say that I wasted a couple of hundred because I thought the pricier, the better – boy, was I wrong! Of course, price should always be something you consider. Camping generators are a seasonal investment (unless you live somewhere where you can camp year-round, which in this case, I’m totally jealous). While mid-range camping generators exist, that are reliable and portable, “higher end” or “worthwhile” ones can be in the thousands. It’s important to research the brand and the reviews before purchasing something this large – regardless of name brand. Along with durability, reliability is extremely important in your deciding purchase. It’s important that the product isn’t shoddy and isn’t something you’ll have to find makeshift solutions for to use it properly. Last, but definitely not the least, you’ll want to make sure that the warranty of your camping generator is worthwhile. Any items that are a large investment and do not come with some sort of guarantee are a bonified bogus from a shady company. Generators that come with long-term investments are from companies that are confident in their product and are willing to replace if something happens to it. In this case, the phrase, “you get what you pay for” is everything. As I’ve said before, I found this out the hard way. The Champion Power 42436 was my second camping generator that I tried. After researching and spending much less on my first, I found out the hard way that spending a minimal amount of money wasn’t the best choice. Before reading into this all, I saw how highly rated this little powerhouse of a machine was. With hundreds of reviews from people all around the world, for the price, I was very excited. As for the features, it starts off with 1500 starting watts, but has a consistent 1200 running watts for up to 10 hours on a full tank of gas. For many families, this will allow them to sleep as normal and still have enough power for making breakfast and doing what you wish with the generator in the morning. The engine is the most important aspect of a portable generator, as it means the difference between a well-constructed generator, and one that will go out on you in the middle of the night. Using Champion’s own line of 80cc engines, this powerful generator uses cold start for optimal usage in colder weather. For those that DO go camping in colder weather, you may want to invest in a portable generator like this one. You don’t need to install or have any fancy outlets for this one, as the Champion 42436 is capable of running on normal 120V household outlets. The outlet aspect also has a voltmeter, controls, and monitors for power monitoring and stabilization. Even though it’s technically an inexpensive product, it’s one that comes with more bang for your buck. The durable steel frame will last through the toughest weather conditions and most rugged rides during your time camping. While I don’t recommend that you toss it around carelessly, it’s a device that will be able to handle the blows with class. Last but not least, I discussed warranty and how it shows how good a product is. Thankfully, the Champion 42436 is a device that comes with a great warranty period! Champion Support offers 2-years of limited warranty with free lifetime tech support. For those on a budget and want some reassurance (like myself), this is a huge selling point for us. One of the primary disadvantages of this unit is that it may be hard for some to pull to start. However, I personally had no issue with this, although my friend did. It may be based on personal strength and doesn’t affect the performance at all. The Champion generator can also be used at home during power outages or kept somewhere safe if you need it during work. While I wouldn’t suggest trying to run your entire households worth of products that need to be charged, it’s a good product that does exactly what it needs to in times of need. Overall, I would highly recommend this product for those who want a bit of inexpensive security during camping for devices of communication. First, let’s start off with how many wattage variations the WEN 56180 actually has: 1800, 3500, 4050, 4750, 5500, 7000, 9000, and lastly, 13000. While the price doesn’t stay the same per wattage, it does give you variety for a fantastic price. Being EPAIII and CARB compliant, you don’t have to worry about your campsite being shut down or your device being taken away at a camp ground, as this one is approved in all 50 states. Those that are compliant with these standards are more reliable in terms of usage and safety. As for the power of the primary generator, there is an 1800 surge wattage and 1500 running watts. In having this, you can use it for both emergency and recreation. Choosing different wattage when purchasing gives you different features, so it’s imperative to read more into the specific stats of the wattage of your choosing. For the base 1800-watt size, the surge and running watts remain 1800/1500. The WEN 56180 is a very compact and lightweight generator, being able to run at half load for around 7.5 hours. The amount of gasoline you’ll need to run this on such a small generator is only 1.45 gallons. To me, this is incredible, especially for how much power it can provide. The way you connect and power-up can be done through a standard three-prong AC120V or a cigarette styled lighter powering option that’s 12V (DC). In having this as a feature, it makes it more convenient for those who need it for both camping uses and emergency, at-home uses. Lastly, there is a low-oil shutdown feature that powers the generator off in more dangerous situations to protect the 4-stroke OHV engine. In having this, it not only prevents fires from sparks, but you can feel more safe out in the wilderness if you need this generator. A primary disadvantage of this is that it is slightly louder than some models, but it isn’t super daunting towards others in different campsites. 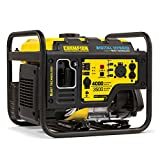 I will say that the performance of this camping generator is fantastic for what I needed it for and I would highly recommend this one to those on a budget and who want a powerhouse. During emergency times, it’s able to keep a refrigerator on and a few lights – what you need to get by. The WEN is most definitely worth a purchase as a reliable staple piece in your camping/emergency kit. For newbies, this may seem like gibberish (and trust me, I was once there, too!) However, the aforementioned are FANTASTIC for generators, and this is only I highly brag about. I use this as a primary generator (yes, I keep the others because I’m a total doomsday hoarder), and I think you’ll enjoy what it has to offer. The fuel efficiency is due to the 111cc OHV engine that produces 2200 watts starting and 1700 running watts, which is slightly higher than the average, bringing you consistent usage. If you choose the 3000-watt option, you’ll see higher starting and running wattages. The portable generator itself produces less than 3% total harmonic distortion, which means that this generator is fantastic for using in emergencies when you want to use your game system, laptop, or television – and it’s totally safe! The 1-gallon fuel tank is just an added bonus, as you’re able to use this generator for up to 8-hours with a continuous operation. (It’s important to note that this is a 25% load when you use it). You can even use this to charge your devices, as there is a USB included! Most on the market currently do not cater to this option, despite it being uses primarily for camping and emergency uses – phones are necessary! he parallel power connector port allows you to connect two units to the device for more charging and more power. Last but not least, the quiet 59dB volume won’t disturb your sleeping, your campsite neighbors, or your neighbors next door to your house that are in the same power outage you are. Based on your location, this variable for decibels may change, as this measurement was taken at a 1/4th load at 7 meters. A primary disadvantage of this device is that it’s not “powerful” enough to run the air conditioner on a large RV. With that being said, you’ll need to invest in something larger for larger power requirements. 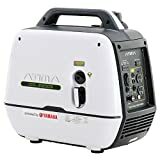 However, this portable generator is a powerhouse that has a fantastic performance for the non-large RV choices and is one I’d HIGHLY recommend to those on a budget. One of my favorite that I’ve ever used, it’s durability is astounding. Honda is a huge name when it comes to power. Whether a car or a portable generator, they’ve been a reliable brand for decades. A recoil starting system is fantastic for getting the most power on startup with a steady stream of continuous power. 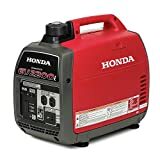 Being more quiet on ¼ load than others on the market, the low-sound is what Honda is known for when it comes to generators. Later in this particular review, we’ll talk more about the run time per tank on this inverter style, quiet machine. Lastly, the power selection for the Honda EU2000I is around 1600W. A large disadvantage that some may find about this is how short of a time it can run. While short, depending on the load, you’re able to charge up your essentials in emergency times during camping, or for the essentials in cooking during your camp trip. (Although, shouldn’t you be using a fire?). The run time of this on a full tank is kind of low in comparison with competitors, so It’s not the best in terms of time. However, it does put out a lot of worthwhile power during this time and has a great performance otherwise. If you’re looking for a quick and powerful generator, the Honda EU2000I is one you should take a look at. Even though the run time may not be the best, it is one of the most highly rated generators on the market and packs a performance that many companies cannot come close to. While some may purchase this based on the famous name alone, it’s worth looking into the actual performance of the machine, first. For those looking to purchase installation and have a bit of money to spare, this is also an option depending on where you purchase from, giving you yet another huge advantage in purchasing this product. The DuroStar DS4000Sis a durable portable machine that is a heck of a monster when it comes to power output and what it can handle. While you may not have heard of this brand versus the competitor brands, the machine is highly reviewed and raved about. The OHV engine has this air-cooled feature to prevent overheating and a low-oil shut off to prevent fire in case of sparks and other issues that may arise. The heavy-duty steel frame is perfect for those who may get a bit rugged out in nature or during harsh emergency situations (weather problems like hurricanes, tornadoes, etc.). As for the full power panel, this includes an oil warning light, circuit breaker, power outlets, and volt meter. While small, it does pack a punch and features an entire control panel for optimal usage and control over your machine. With a much higher watt surge and continuous wattage than the competition at this price, the DuroStar is the brightest nova in a sea of constellations. Using only 4 gallons for 8-hours of powerful run time, this model is one of the most progressive in the best portable generators for camping on the market. While there aren’t many disadvantages to this product, it’s worth mentioning that one may be that you shouldn’t use synthetic oil. Although this may be a disadvantage to some very picky people (it’s your money so it’s okay to be picky), it doesn’t affect the performance and needs premium oil. A bit more costly than synthetic, the price of the generator itself makes up for the cost of needing premium oil. Overall, I would HIGHLY recommend this machine to anyone looking for a huge powerhouse for an inexpensive price. While it was a backup for me during one camping trip, I keep one on hand for camping purposes as a primary generator and one at the house for emergency purposes. In mentioning this, I hope you show you my trust in this particular machine. The brand did a fantastic job at putting a worthwhile generator together without and give and take, as this machine has it all. Even after throwing all of these your way, you may be feeling overwhelmed in what to purchase. 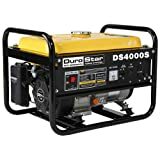 If you’re still looking for a bit more guidance, the most notable and best portable generators for camping include the DuroStar DS4000S model we’ve mentioned on this list. Quiet, powerful, and durable, there isn’t anything else you could ask for in a camping or emergency generator. At such a great price for what it offers, those on a tighter budget who want to travel will feel compelled to purchase and try this model out.